In this recipe, I combined cornmeal, rolled oats, cinnamon, lemon juice, dates and coconut water to create the ultimate healthy dessert. 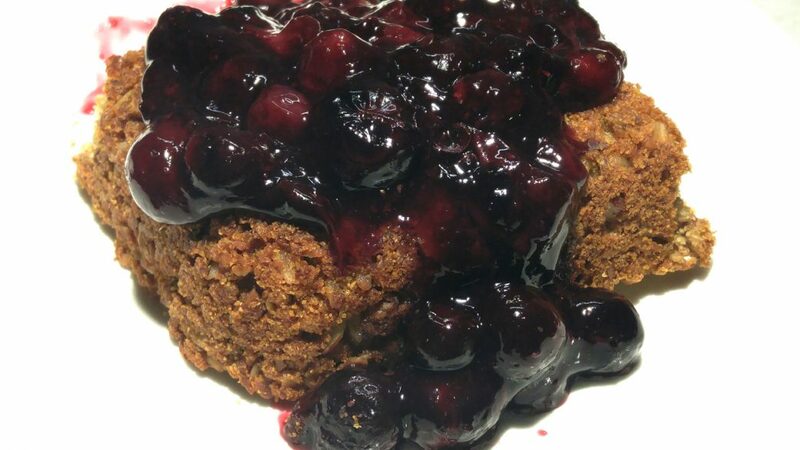 I topped it with a healthy blueberry compote. Preheat your oven to 400 degrees Fahrenheit. While the oven is preheating, combine all the ingredients in a medium bowl. Mix very well and let sit for about 5 minutes so the liquids can be absorbed. I used an 8” x 8” pyrex oven safe dish to bake this. You have a few options. I use parchment paper to line the dish. It should be about 1” deep when spread out. Bake for 20 minutes. While the cornbread is baking let’s prepare the compote. 1 cup of blueberries. Raw or frozen. Combine in a small saucepan. Bring to a simmer and turn off the heat. By the time your cornbread is done this will have settled into a nice thick consistency. After 20 minutes remove the dish and let it cool for 15 minutes. If using parchment paper gently remove and play on a cooling rack. This sounds amazing and easy to make!! This looks totally delicious and easy enough for even me to try and make! I just need to do some shopping for ingredients. I’ll let you know how it turns out.